Everyone creates a custom colored high bounce ball! Kids create their own color schemes then bounce 'em sky high! 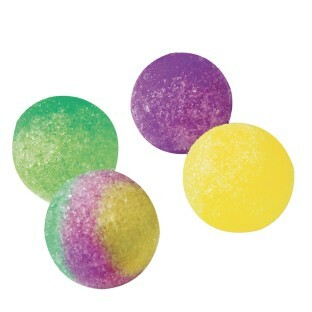 1" balls are easy to make with plastic molds and assorted color sand crystals. For longer life, store balls in a sealed plastic bag. CAUTION: Contains a chemical that is toxic if a significant amount of the granule is swallowed. Not to be used by children under 8 years old. Use under adult supervision. I purchased this for about 60 children attending camp. 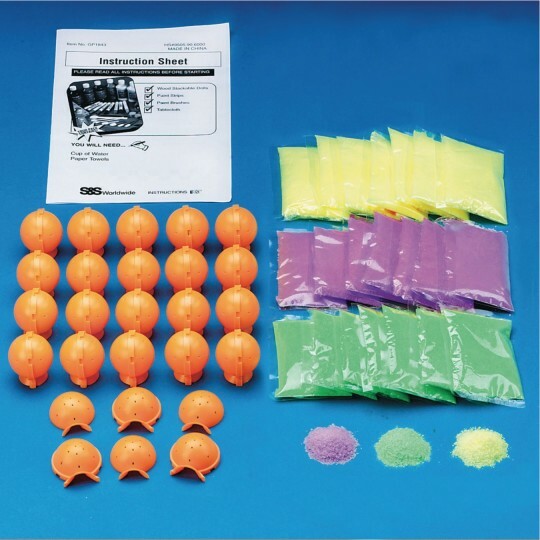 The bouncy ball directions were clear and the parts simple to put together yet unfortunately the bouncy balls only completely solidified for every 1 in 5 or so balls. For the rest balls that weren't effective the crystals stuck to the mold and when you tried to get the balls out and crumbled apart. We tried dipping the balls in different temperature water and submerging them for different lengths of time yet we ultimately could not figure out why some were working and others were not. That being said most the kids enjoyed the making ball in spite of the fact that many were misshaped. Merchant response: Sorry to hear you had problems with this. We'll do a quality check to see if this is a lot issue. Other reviews have been very positive, so we'll investigate. In the meantime, our Customer Service department will be in touch to make this right. Bouncy Balls were fun and easy to make. Made them over the summer at our library. They do dry out easily after made.